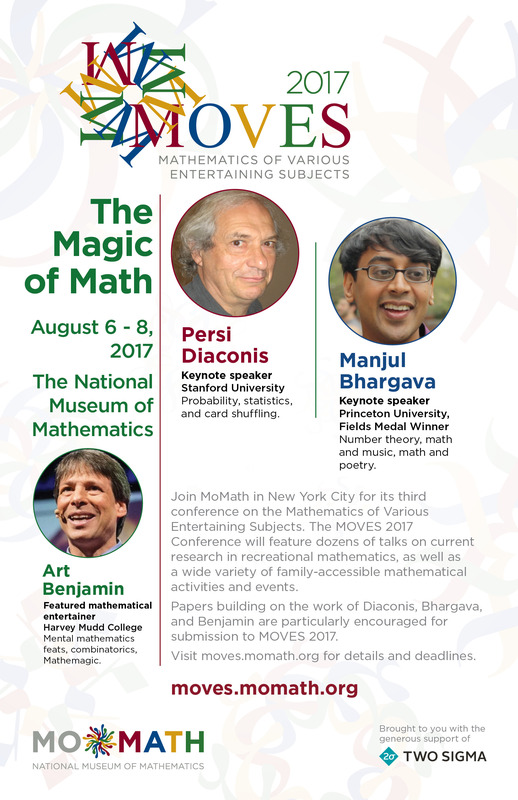 The 2017 MOVES conference took place in New York City at The Graduate Center, CUNY, from August 6 – 8, 2017. MOVES 2017 attracted over 229 attendees from 23 different states and 8 different countries. Attendees explored America’s only Museum of Math in a night open exclusively to conference attendees and featuring a special guest, then participated in two days of sessions on the mathematics of games and puzzles. Dr. Diaconis is a professor of statistics and mathematics at Stanford University and a 1982 recipient of a MacArthur “genius” grant. A former professional magician, he now studies randomness and is well known for his work on card shuffling. He has shown that after seven riffle shuffles of a standard deck of 52 cards the deck is sufficiently random. Dr. Bhargava, a professor of mathematics at Princeton University, is a 2014 recipient of the Fields Medal, and is famous for his work in number theory. Less well known is his interest in the connections between math and both traditional Indian music and Sanskrit poetry. He also enjoys teaching math classes to humanities majors, and has taught classes on math and music, math and poetry, and math and magic. Dr. Benjamin is the Smallwood Family Professor of Mathematics at Harvey Mudd College. Among his many awards are the 2017 Communications Award, given by the Joint Policy Board for Mathematics, and the New York Times Bestseller in Education (top 10) in 2015 and 2016 for his book The Magic of Math: Solving for x and Figuring Out Why. He was selected by Princeton Review as one of The Best 300 Professors in 2012. Dr. Benjamin’s TED talks are among the 20 most viewed of all time. For previous conferences, take a look at MOVES 2015 and MOVES 2013. You can also purchase the MOVES Conference Proceedings book: The Mathematics of Various Entertaining Subjects: Research in Recreational Math. Thanks to all the donors, supporters, presenters, and attendees who helped make MOVES a success! String figures, the imaginative designs created with simple loops of string, are found among the world’s most ancient cultures, but these loops may also be used to create remarkable mathematical structures. Join Karl Schaffer as he uses large loops of rope and string to form polyhedra and other geometric designs, and then morphs one to another in surprising ways.